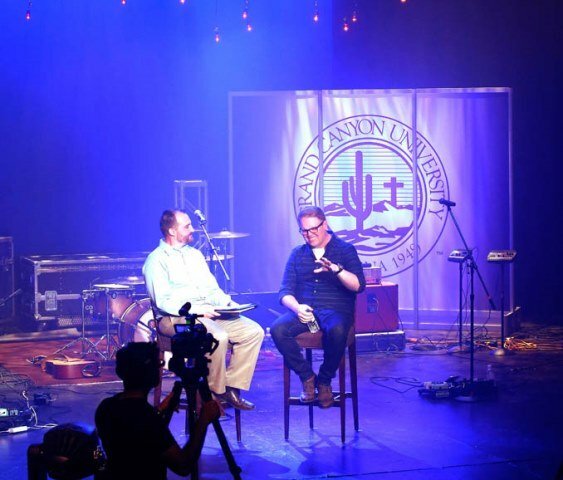 GCU officially launched the Center for Worship Arts on Tuesday with (left) Dr. Jason Hiles, dean of the College of Theology, and MercyMe lead singer Bart Millard, who will direct the Center. 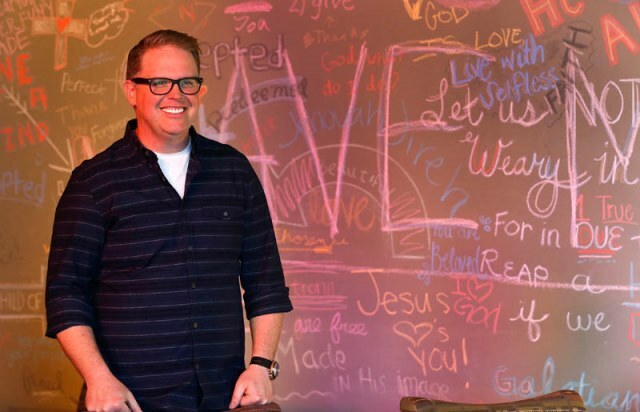 Bart Millard is a Christian music recording star, co-founder and lead singer of the Grammy-nominated, American Music and Dove Award-winning band MercyMe, husband, father of five and a humble guy. He’s also something you might not expect – a college drop-out. “I’m still a sophomore because this program didn’t exist,” he announced to an enthusiastic audience of about 300 at Grand Canyon University on Tuesday evening at the official roll-out of the Center for Worship Arts. This fall, it will begin preparing its first freshman class of students for a variety of careers in ministry and give students more options than he had 20 years ago. Millard, the Center’s director, was introduced to a full house of church leaders, current and potential GCU students, parents, University personnel and others by Dr. Jason Hiles, dean of GCU’s College of Theology, the new Center’s home. 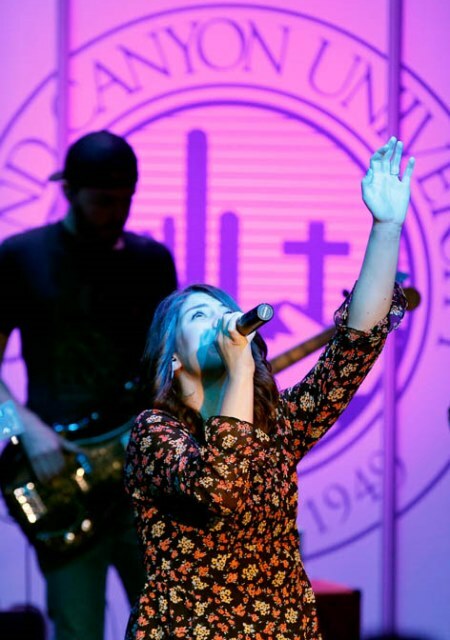 Within it, a bachelor’s degree program will offer four emphases – digital production, worship management, worship ministry and worship production. Years ago, Millard tried college, but he was consumed with making music and dropped out of school to avoid wasting any more of his grandmother’s tuition money. Millard turned her words into a hugely popular band, but he wants more for tomorrow’s worship leaders. He wants them to learn about and be mentored in all aspects of the music business, from promotions, performing and production to songwriting, sound mixing and staffing, and to follow their passion into the real world with integrity. Millard also wants their parents – or whoever’s picking up the tab for college – to be relieved and excited about their children’s diplomas. GCU kicked off the Center’s debut Tuesday in style. Swiveling spotlights bathed the Ethington Theatre stage in blue beams, and orange bulbs dangled from the ceiling. GCU President and CEO Brian Mueller introduced Hiles and leaders in two other colleges – both integral partners in the Center – Claude Pensis, dean of the College of Fine Arts and Production; Dr. Kevin McClean, interim dean of the Ken Blanchard College of Business; and sports executive Jerry Colangelo, whose name is on the business college’s School of Sports Business. Mueller, who began talking worship-arts shop with Millard about 18 months ago, said the Center will create a new generation of worship leaders to impact churches around the world. “This is a very big, very important night for us,” Mueller said. GCU’s Chapel band then came on stage, performing three songs that brought audience members into a variety of worship stances, from swaying and praying to applauding and singing along. Later in the evening, Millard noted he had heard the University’s musicians perform earlier this year at the Roadshow, one of the biggest Christian music tours in the country. “I’m not exaggerating when I say they stole the freakin’ show. There’s a legacy here that’s already in place,” said Millard, drawing a burst of applause. Millard said the new Center, housed in the College of Theology, will equip tomorrow’s worship leaders to move out into the world with integrity. During a 45-minute Q&A with Hiles, Millard talked in detail about his vision for the program and its students, and why GCU is the right place to lead them. With churches and church music changing drastically over the past decades, Millard said he saw a need for a new breed of worship leader. But he didn’t plan to be the one leading the training. Dozens of Millard’s fellow artists are aware of the new Center and want to be involved in mentoring students. That interest and a theologically sound curriculum – students will be required to complete 32 credits in theology – makes GCU’s program unique, he noted. “I don’t think there’s anything close to what is about to happen here,” Millard said. He acknowledged the program could create a micro-music industry or “catch lightning in a bottle” with new songs that become popular among churches and on iTunes. That won’t be the Center’s mission. Maddison Harris, the program’s first freshman student, ends the evening with a song. The Center for Worship Arts at GCU will be the next step for high school graduates who are certain of their calling and for those who know it’s something but just need a little help narrowing it down, he said. Millard doesn’t believe it will take much to fill the program, and already his first student is enrolled. Maddison Harris of Dallas “is neck deep in humility, and she and her family are dripping with integrity,” said Millard, who for years has known her father, Mark, himself a worship leader in Texas and formerly of 4Him. The younger Harris helped close Tuesday’s program by joining with the Chapel band in “Oceans (Where Feed May Fail)” by Hillsong United. The 18-year-old appeared shy at first, but once the music began, she warmed up the stage, smiling, eyes heavenward and reflecting God’s grace. Just the kind of freshman you want.